WOW --- What A Ride!! ``Life is not a journey to the grave with the intention of arriving safely in a pretty and well preserved body. WOW --- What A Ride!!" 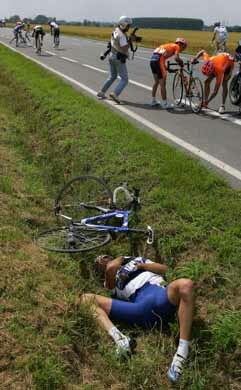 Below 2 pics were snapped from early stages of the 2004 Tour de France. 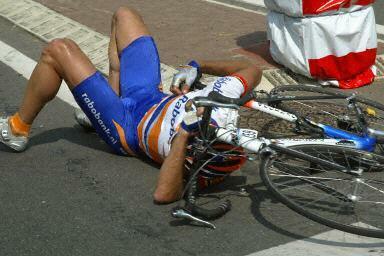 The above 1st pic of a cyclist from RaboBank might epitomise the afore-mentioned philosophy about 'giving it your all', even if it entails a few 'lumps 'n bumps'. But the pic on RHS, where the poor unfortunate seems to be left-for-dead, definitely don't imbue the afore-mentioned ethos, predicated upon the fundamental aphorism that "we've only got one life", so "pack as much in as you can". But not if you are going to end-up like the TdeF competitor on the RHS.